Here we will provide information about AP EAMCET 2016 notification. 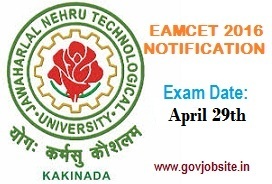 Andhra Pradesh State government announced the AP EAMCET 2016 notification exam date is on April 29th.Application form for AP EAMCET 2016 registration will be available here soon. You can download registration form from www.apeamcet.org, and also from JNTU Kakinada official website. The AP EAMCET 2016 Application Forms have been released on 15th of February, 2016. The candidates have to fill the AP EAMCET 2016 Application Form ONLINE only. They can visit the official website www.apeamcet.org and fill the form. You should keep the following certificates while filling the application. 7. Proof of local status. Candidates will be asked for certificates of all of the above mentioned documents at time of counseling.